Believe it or not, December is here. The holidays arrive faster every year, don’t they? At this rate, I figure that by the time I’m 85 it will seem like Christmas shows up at two-week intervals! Many of us are approaching this holiday season with a much smaller budget than we have in seasons past. That isn’t necessarily a bad thing, of course. I’ve explained to my kids that we’re going to do “Christmas lite” this year. I hope that by making more time for holiday activities — crafts, lots of baking, and time spent together — we won’t mind the fact that the pile under the tree is less than half its usual size. With so many extra things on your to-do list this month, you may find it increasingly difficult to find time for your “regular” creative work. If you’re able to work in brief snippets, try to get in at least 10 minutes a day. Even the briefest creative session helps you stay focused on what you’re working on — and keeps your project simmering in the back of your mind while you’re busy with other things. If you can’t work in small chunks, try to schedule at least one two-hour session per week, or whatever your minimum is. Now is not the time to end up feeling grouchy and resentful on account of being separated from your creative self. If you have any favorites of your own, please share! Of course, one way to make do with less — and flex your creative muscles at the same time — is to make your holiday gifts yourself. One year I made wreath ornaments from dried hosta stems trimmed from my garden. Another year I hand-painted trinket boxes. For a long time, I made my own Christmas cards (up to 100 of them each year) by creating mosaics from all the Christmas cards I received in the previous year. One year I even made my own wrapping paper. Then there was the candy making; peanut brittle, fudge, truffles, and other treats packaged for gifts. I miss having time to do those things. (I know, “someday…”) This year I don’t think I’m going to have time for making gifts, aside from a bit of baking for the neighbors. How about you? If you like homemade but can’t make that happen yourself, don’t forget to shop at Etsy, where many of this blog’s community members sell their creative work. Another tip: For all things merry and bright — without going over the top — Simple Mom has a series of holiday posts that might inspire you. And if you haven’t seen it yet, Keri Smith has a fun holiday treat at her site that might amuse. My list? Well, the holiday cards are in hand (I even ordered my own photo stamps this year — too cute!) and my shopping (mostly done online) is nearly finished. I have a few more decisions to make, but I hope to have the gift tasks done by the end of this week. On Saturday we’ll go and cut down our tree — and decorate that, along with the house, on Sunday. The week after, my oldest son turns 18, so there will be a bit of festivity on his account — and then we will hopefully have smooth sailing to Christmas, with lots of fun holiday activities for any of the kids who want to participate. One of our favorite holiday traditions is decorating gingerbread houses on Christmas Eve. 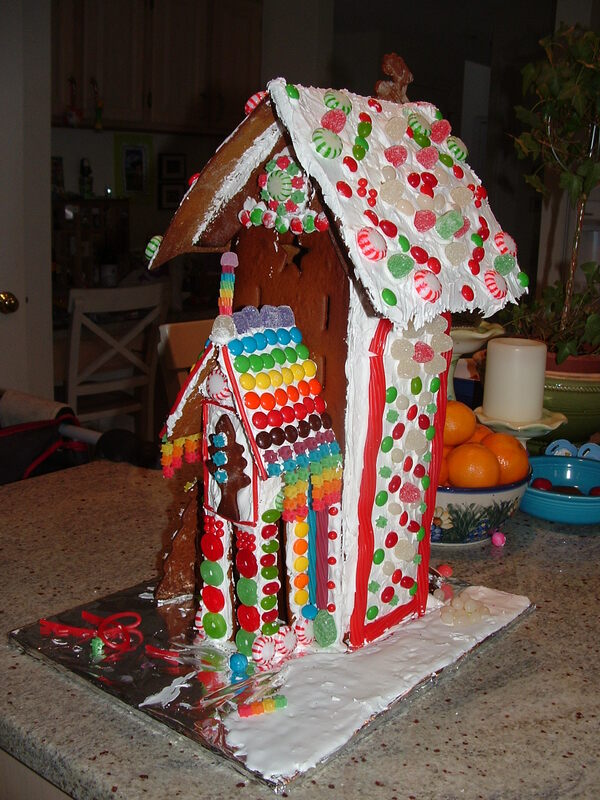 Two years ago, instead of each decorating our own smaller house, we collaborated on a single “mansion” (see photo). That became our new tradition. My mother — creative genius that she is — prepares and assembles the house in advance, so we can all just decorate (and munch). How are the holidays shaping up in your creative household? I’m finished with the shopping and all the gifts are packaged up and ready to be shipped to their destinations (San Francisco, Australia, Germany, and Albany, NY respectively). My early Christmas present to myself was getting Sam into all 5 days of preschool (Ask for help and the universe responds. At parent/teacher conferences I told his teachers that I wanted him in all 5 days and a week later, a classmate announced he was moving, and voila, the spot was mine.) Now that my mornings have freed up significantly, I’m looking forward to getting more writing accomplished AND doing a lot of fun holiday baking. My birthday is Christmas Eve, and I put my foot down this year and said I would no longer celebrate my birthday and Christmas morning in any house but mine. Tom agreed, but this means flying Christmas afternoon to Albany and his brother’s house for the rest of the holidays. For my birthday, we’re going to keep it simple. Take-out Indian, my yearly ice cream cake, and a trip to the local animal park to drive through their lights/petting zoo. We’ll be able to feed reindeer, zebras, donkeys, etc. from our car. wow we have a slew of holiday season bdays – i think kelly’s and lisa d’s is tomorrow, mine is on the epiphany, my mother’s is yesterday and my dh’s is fri! i haven’t even started the whirlwind yet. but i’m designing a photo card in my head and thinking of our major events of the year for the randomly ‘annual’ letter. however, i’m already overbooked on local events leading up to christmas. triple booked on the 14th. good for you brittany! i’m in the same boat as you are, cathy. i haven’t even started yet. i have my last major arts festival of the year this weekend in tallahassee so i’ve been prepping for that. will get to decorating and shopping next week! i try to make many of my gifts as well, if not arts/crafts, then baking. this year, i’m most excited about what i’m making for my sister. since she just got married, i’m making big walls letters with her and her new hubby’s initials for their new apartment. that will be fun. Add my daughter to the list of December birthdays. I’m busy getting ready for her first birthday party this weekend (sniff, sniff) and the then the slew of things that need done for the holidays. I am going to try to get some writing in, but the time spent will be significantly less this month. When I think about how crazy I was last year at this time with a newborn, however, this year is a breeze. My creative contribution to the holidays is my fudge. I make it for family and friends.